Growing Up Disney: A Walk Around The World With Ridge-- Lucky Dogs! My cousin Jeff his wife Windy and their two girls Madeline and Natalie are in Disney World right now and yes I tried to go with them but it was on short notice and I couldn't get a room with DVC points... However, This is only my cousins' second trip to the World and they are already becoming old pros at it. On Wednesday morning they had the best luck. They got to the park early for rope drop and Jeff was talking to one of the cast members about the opening and what they should do and general questions. Well wouldn't you know it that the cast member picked them to be the Family of the Day!?! 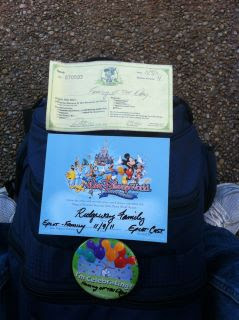 They got to open Epcot, received a certificate that makes it all official and fast passes. I'd say that was a heck of a day. But to cap it off the oldest Madeline's birthday is today "Friday" at dinner Wednesday at the Flying Fish she was given a white chocolate Mickey Mouse. I say it has been a great week for them. Natalie, Jeff, Windy and Madeline.